Can you pass these road signs? 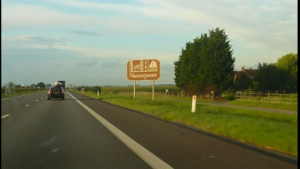 When travelling along the highways of Europe, it is virtually impossible to miss the brown signs erected to highlight a nearby leisure attraction. Most of the time we are on a tight schedule to reach our destination, so we drive past and can only wonder what delights we may or may not have missed. Then there comes a time when we are travelling by car with no fixed deadlines, just the urge to explore. So the invitation, extended by a brown sign, with its basic pictogram showing a castle, monastery, an ancient town or even a theme park can sometime become irresistible. We slow down and take the next exit to discover a new place. When travelling by air, I take it as read that the surface I pass over will mostly remain a mystery to me. When travelling by train, I get to see the towns and countryside, but unless I have GPS, or a map I am not always sure what I am looking at, or what the town I pass through has to offer. On a coach I can read the signs, but have no opportunity to follow to where the brown signs lead. It is only by car that I can really appreciate what is on offer. In this way I have come across all sorts of fascinating places. From unheard of character filled towns, to the foundations of “Big Bertha” a massive First World War gun and Parc Asterix. So when I pass one of these signs and have to drive on, it is often with regret. Am I alone in feeling this way? Updated 24 March 2011 for #FriFotos on the Theme of ‘Signs’ on Twitter.